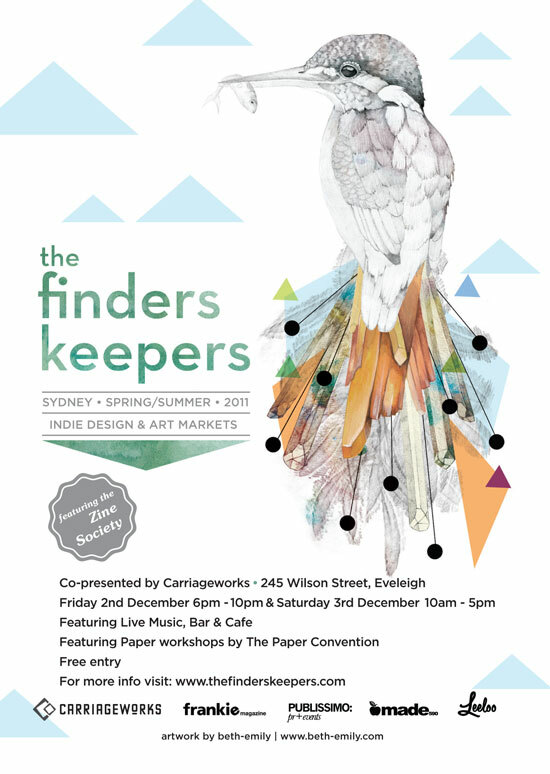 Yes, it is already that time of year again… The Finders Keepers Market for Spring/Summer 2011 is on this weekend! Yay! This incredible event will be held on the evening of Friday 2nd December from 6-10pm and all day Saturday 3rd December from 10am-5pm at the amazing CarriageWorks in Eveleigh. As proud sponsors, you’ll be able to find us there, along with some of your other favs including Made By White, Candy Stripe Cloud and frankie magazine, as well as friends of Made590, newcomers Me & Oli, The Raisin Did It and Emily Green! It is an especially great line up this year of some of Australia’s best emerging designers and artists. You can view the full list of stallholders here. Come along to check out free workshops, listen to some live music and have a drink as you shop up a storm. Over the next couple of days we’ll let you know what we have in store for you if you plan on going to the markets, so stay tuned! Australian Design for your Australia Day! More Spring Drops at Made590! Previous Previous post: Perch Ceramics have arrived! Next Next post: What's in Store For Finders Keepers…!